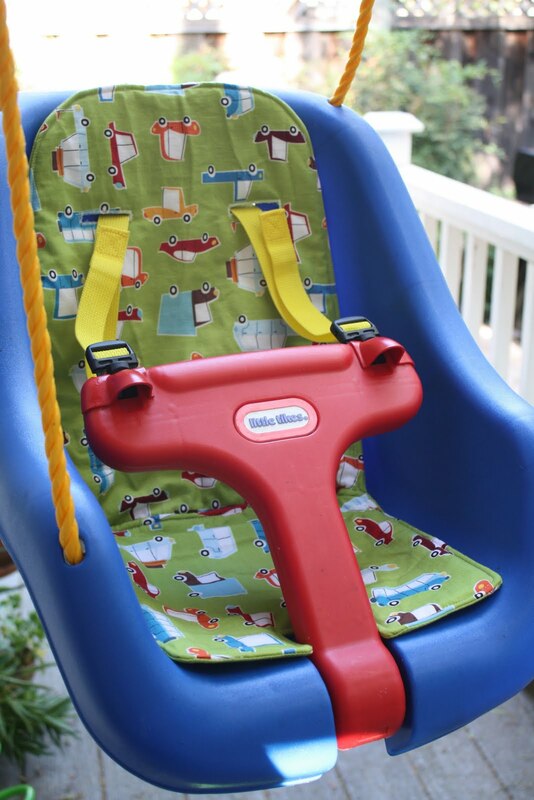 As was the case with our beloved Antilop highchair, I've been thinking our little guy is bothered by the hard plastic of his Little Tikes swing. Because the plastic is slippery, he slides down a little and looks miserable after a short while. And then the fun was gone (kid's book reference, anyone??). So, I've come up with a pattern and tutorial for a cushion! Yay! Match up the diamonds to assemble the paper pattern pieces. Cut out your fabric (making sure to cut on the fold) as directed on the pattern pieces. On the right side of the fabric, mark the location of buttonholes and placement for the straps. Do this only on the designated "back" piece. For both "front" and "back" pieces, mark the large dots. I've got a little trick for marking fabric, especially through layers. Poke pins through the pattern/ fabric and use your fabric marker to make a dot right where the pin goes through. Cut out the batting. Then, cut a strip of fabric 3" wide, by 12" long. Cut the strip in half, creating two pieces that are 3" by 6". With the "front" pieces (without markings for buttonholes/ straps), lay the fabric wrong side down on the batting. Iron to smooth out and then pin all the way around. Zig-zag or serge the edge. This keeps the batting and fabric together for subsequent steps. Then, match up the large dots and ease the cushion back piece around the seat piece. Use plenty of pins! Then sew it up. Press the allowance toward the seat, pin, and sew down. This is tricky, but just take your time. With the "back" pieces of fabric, match up the dots and sew as you just did for the front. Then, with right sides together, and starting at the seam, pin the front and back together. Be sure to mark about a 4" opening (I remind myself to do this with double pins) since you will have to turn the cushion inside-out. Sew all the way around, pivoting at the seam that connects the cushion back to the seat. Clip corners and trim the edge, close to the seam, to reduce bulk. Turn the cushion inside-out. Press the entire cushion and then pin the opening shut. Top-stitch the cushion, pivoting at the seam, or just leave as-is and hand sew the opening closed. Next, it's time to address the buttonholes. These have to be large enough for the straps and buckles to go through. Instead of an actual buttonhole (as in, using the buttonhole function on your machine), carefully mark the lines connecting the dots to make a rectangle. Sew a straight seam directly on these lines. Then, VERY carefully, using an exact-o knife or other sharp implement, cut the opening. I like to use pins on either end so you don't get carried away. Then, using a tight, medium-width zig-zag (length set at "1" or less, width set at "3" or so), carefully zig-zag around the opening, being sure to catch the edge all the way around. Do the same for the other buttonhole. Next, take your 3" x 6" strap pieces. On each piece, fold and press both long ends of the strip 1/4", then fold the entire strip in half length-wise, matching up folded edges. Zig-zag all the way around. It's okay that the short ends are left raw. Using the marks as a guide, sew the straps in place on the backside of the cushion: line up one short end with outer-most side of your strap placement markings and pin. Zig-zag right along this edge (catching the raw edge) and then sew a 1" square (just like the markings) to hold the strap in place. Then, sew the other strap in the same way. They should overlap in the middle of the cushion back. You can trim them so they don't overlap as much, or leave them as is (I trimmed them). Finally, sew the hook onto the right strap (facing out) and the loop onto the left strap (facing in, toward the hook side). Try it onto your swing! 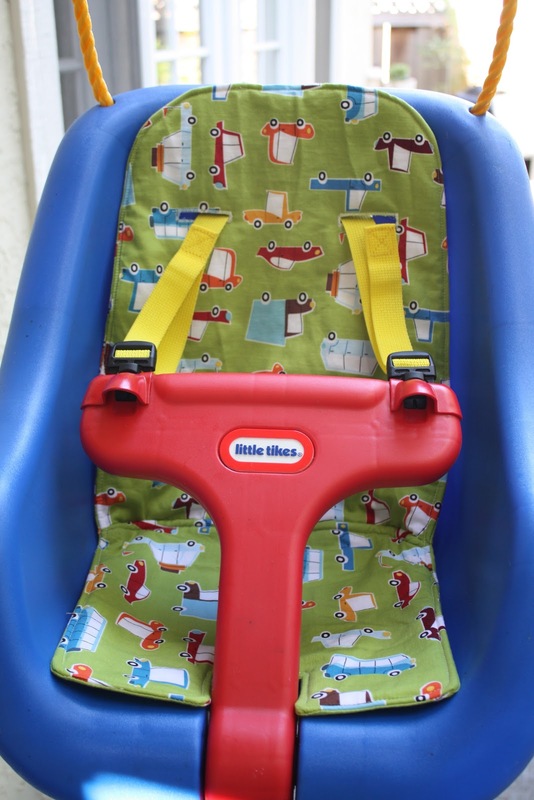 The shoulder straps should go through your buttonholes and the fabric straps should go through the square holes at the bottom of the seat. Enjoy! This is a fabulous idea! My little guy is always sliding down in his swing too. I will definitely be making this! Thank you! Sorry for the delay--we were away on vacation! I usually put the print face-up, but it doesn't matter if you cut on the front or back side of the fabric, as long as you are consistent with all of the pieces. Good luck!